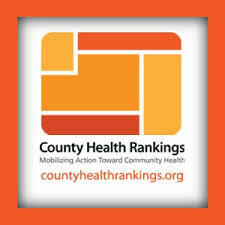 The prominent County Health Rankings reports provides counties in each state with information about how their county ranks compared to other counties on key health determinants. The reports are prepared through a collaboration between the Robert Wood Johnson Foundation and the University of Wisconsin Population Health Institute. They look at a variety of measures that affect health such as the rate of people dying before age 75, high school graduation rates, unemployment, limited access to healthy foods, air and water quality, income, and rates of smoking, obesity and teen births. designed to provide information for community health planning. They have been used to garner support among government agencies, healthcare providers, community organizations, business leaders, policymakers, and the public for local health improvement initiatives and provide important information for all groups and agencies working on health related issues. Detailed information can be obtained from the main website (www.countyhealthrankings.org).